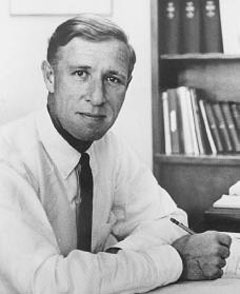 Konrad Bloch won the Nobel Prize in Medicine in 1964, shared with Feodor Lynen, for discoveries involving the mechanics and regulation of cholesterol and fatty acids. He also developed a method for using radioisotopes (radioactive atoms) to trace the path of molecules in cells and living organisms, and later studied each of the 27 carbon atoms in the cholesterol molecule. Bloch's research showed that all natural steroid-related substances in humans are derived from cholesterol, and established many of the steps involved in converting acetate into cholesterol. Later in his career, he studied the metabolism of olefinic fatty acids, and investigated glutathione, a substance used in protein metabolism. Bloch was German and Jewish, and fled Nazi Germany in 1934, shortly after Adolf Hitler took power. He first found refuge in Switzerland, where he worked a tuberculosis sanitarium, then settled in America, where he became a citizen and conducted most of his important research.